Built on the classic combination of fruit, cheese and nuts, this Pear and Brie Crostini is a delicious, elegant and simple to make appetizer. Have you ever been to a dinner party where all they served were appetizers? Well I love such parties. I think it’s so much fun to be able to sample so many different nibbles and experience all the various flavours and textures. Some of my favourite appetizers are those that combine both sweet and savoury elements in the same bite. This Pear and Brie Crostini does exactly that. This simple appetizer is built on the classic combination of fruit, cheese and nuts. 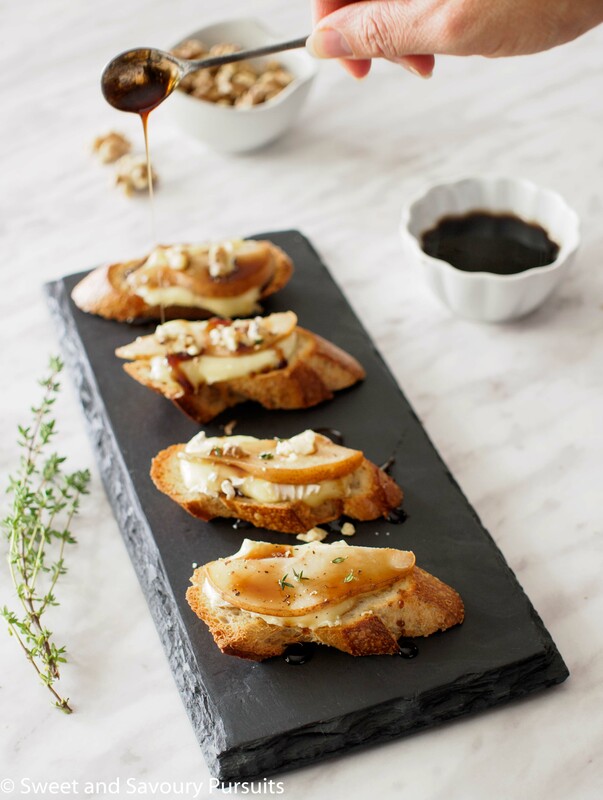 The brie and pear are layered on top of a crostini (a previously toasted slice of baguette), put under the broiler and then drizzled with a honey and balsamic syrup. To finish this appetizer off, it gets topped with toasted crumbled walnuts, a sprinkle of fresh thyme leaves and a dash of freshly ground pepper. It’s heaven in a bite! With a season full of special occasions upon us, it’s great to have delicious, elegant and yet simple to make appetizers in our repertoire. 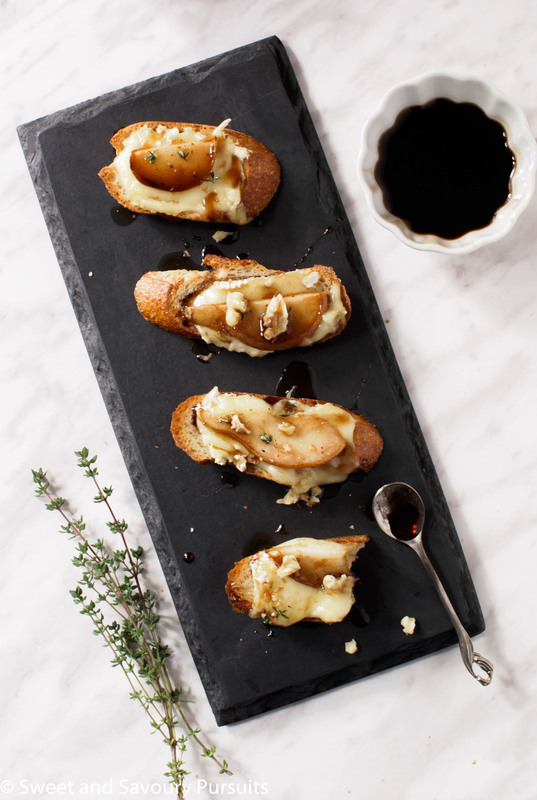 Include this Pear and Brie Crostini on your menu next time you entertain and you’ll be sure to impress! Start by placing a rack 6 inches from the broiler element and heat the broiler on high. Place the baking sheet under the broiler and toast the bread until they are crispy and lightly golden on top, about 1 to 2 minutes. Meanwhile, combine the honey with balsamic vinegar, add the salt and stir. Set aside. Layer the crostini with a slice of cheese topped by a slice of pear. Broil until the cheese starts to melt. Pull out of the oven and drizzle with the honey and balsamic syrup. Add a few pieces of crumbled walnuts, a sprinkling of thyme and a dash of freshly ground pepper. *You can toast the walnuts in a 350ºF oven for about 8-10 minutes or until they are fragrant, let cool and chop coarsely. How far in advance can you make the bread for bruschetta? Hello, up to 3 days ahead of time. Make sure to let the bread cool completely before storing in an airtight container. Also, if there is a lot of humidity in your home you may need to crisp up the bread a bit before topping. Hope that helps! These costinis are to die for. I love the combination and the honey-balsamic drips. Yum! Thank you Fae, it really is a delicious combination! What a great appetizer! Looks so elegant and the taste would be amazing. Brilliant! OMG, this looks absolutely scrumptious! How do you think this would work with blue cheese or gorgonzola and walnuts? I love toasted blue cheese and almonds. oh yum! I’ve just found a new addition to my xmas canapes list! Hi Nicky, you’re right they would make a great Christmas or New Year’s canapé :). Thanks! Hi, what’s great about crostini, is that you can slice the bread real thin, this way there is hardly any bread at all and you will mainly taste the toppings. Hope you enjoy it! What perfection on a plate! I heart brie and could inhale a plate of this right now. I have been dreaming of Brie for sometime and now I come across this lovely recipe You’ve motivated me to make some crostini. Thanks for sharing! Thanks Liz, and it’s my pleasure! Thanks Lily. I completely agree that we end up eating more, but it so much more fun to sample a bunch of different appetizers. This crostini looks absolutely perfect! Love these classic flavours, amazing! Wow. I love the look of these, and I bet they taste even better! I love this combination of pear and Brie–it sounds wonderful! Thank you Nancy! Fruit and cheese pair so well together. I love appetizers too.This one looks delicious. Wow I love everything about this! I like grazing get togethers too.